The most recognizable superheroine of all time, Wonder Woman has been an essential part of the DC Universe and an icon for female empowerment for more than 75 years. Armed with her lasso of truth and her bullet-stopping bracelets, the Amazon Princess journeys into Man’s World again and again, spreading her mission of peace and goodwill and fiercely battling injustice where she finds it. She’s a princess, a warrior and an ambassador. Beautiful as Aphrodite, wise as Athena, stronger than Hercules, swifter than Mercury…she is Wonder Woman! 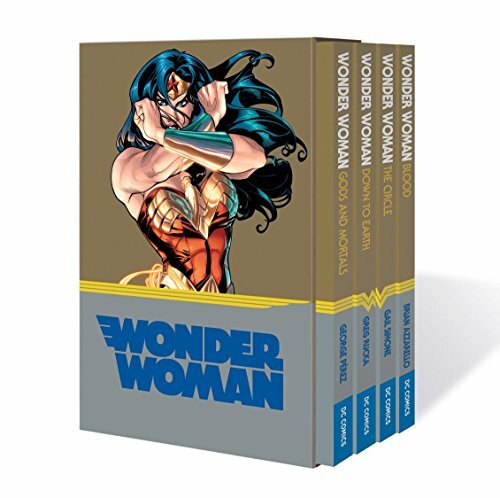 WONDER WOMAN: A CELEBRATION OF 75 YEARS collects more than 400 pages of the iconic heroine’s best stories, from her first appearance by William Moulton Marston and H.G. Peter, to her mod ’60s redesign by Denny O’Neil and Mike Sekowsky, to her present-day adventures by Brian Azzarello and Cliff Chiang. Other legendary talents featured include George Pérez, Darwyn Cooke, Robert Kanigher, Gene Colan, Phil Jimenez, Mike Deodato, Greg Rucka, Gail Simone and more.